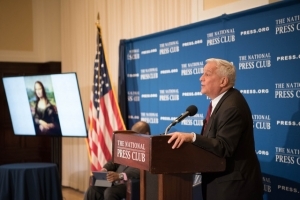 Walter Isaacson, at a National Press Club Headliners Breakfast on Jan. 18, 2017, discussed his latest book on Leonardo da Vinci and described the years of work the artist put in to make the Mona Lisa painting. Walter Isaacson, biographer of Benjamin Franklin, Albert Einstein, Steve Jobs and Leonardo da Vinci, urged a National Press Club audience on Monday to cultivate curiosity and observation as da Vinci did, saying the example changed and enriched the author’s own life. Speaking at a Dec. 18 Headliners Breakfast book event about his biography of da Vinci, Isaacson pulled out his small, red notebook, the same size as some used by the painter, to encourage the audience to follow suit. “It’s good for an enriching life to just keep that little notebook...catch those things we see every day from the blue sky to the way light hits a certain object...to the expression on somebody’s face,” he said. Isaacson, called the “biographer of geniuses,” described genius as arising from curiosity, observation and imagination applied to everything. In his biography of Franklin, Isaacson realized the key to Franklin’s creativity was combining science and the humanities, he said. Einstein loved music, and Jobs was “the most creative person of my generation,” he added. Isaacson noted that da Vinci was fortunate to be born out of wedlock so as not to be required to join the family business and become a notary. The artist was a “wonderful misfit - illegitimate, gay, left handed, sometimes vegetarian, distracted and had no specialty,” Isaacson said, adding later that da Vinci was accessible to the world as a human because he had difficulty with higher math and learning Latin, was good looking and vain, but had a sense of humor. As a young man, da Vinci was fortunate to work in the workshop of the Florentine painter Andrea del Verrocchio, where he learned not only art, but science. Isaacson cited the example  of soldering a copper ball for the cathedral dome. “Mixing art and engineering, that is the key to how we humans survive, as opposed to machines, in the digital age,” he said. On every page, da Vinci listed questions that he wanted to answer, the author said. Isaacson cited two examples, one of a scientific principle and one illustrating curiosity for its own sake: da Vinci’s Law of Branching observed that the area of the cross section of branches - of trees, rivers or arteries - equals the area of a cross section of the trunk. His careful description of the tongue of a woodpecker demonstrates curiosity for its own sake. “It is hard to understand the depth of his art, how much science went into it, as when you see page after page of dissection of the human face,” Isaacson said. It all comes together in “the greatest painting ever done,” the Mona Lisa, he said.